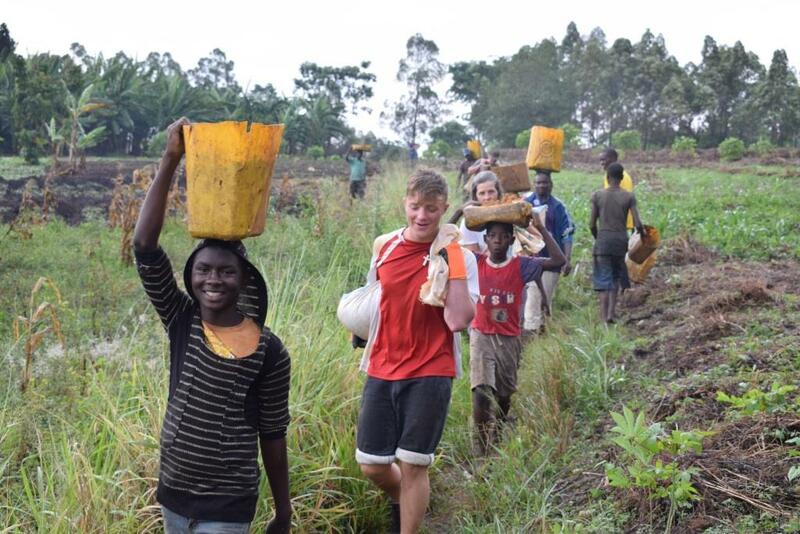 We are pleased to welcome back the 18-strong group from St Peter’s church in Bishop’s Waltham, who spent two weeks in Uganda visiting and working on the Rumbugu project, and engaging with the WATSAN staff team and beneficiaries. The group set off on 17th August 2017 after more than a year of preparations and fundraising to support WATSAN’s Rumbugu project and their travel costs. They were led by Reverend James Hunt and included nine young people and nine “young at heart” from the church’s congregation. They were accompanied by WATSAN Chair Ian Bensted, and given an extremely warm welcome by the project Director Eric Baingana and his staff team, as well as Rukungiri’s Bishop Benon Magezi. They were hosted in Rukungiri at the farm of former WATSAN Director Eric Kamuteera and his wife Adrine. The group’s primary work was to help the local WATSAN team finish construction of some new toilets at Rumbugu primary school, which serves 400 children, and also to help construct the protection for two springs that now provide clean water for a local village. In addition, they also worked on a spring at Katete (pictured), provided some consultancy advice to three hydro-electric plants, visited a mission hospital, supported some health and hygiene education sessions, helped lead church services with hundreds and even thousands of people, spent time with some orphaned and disabled children, and finally, put on various activity days for well over 1,000 children and young people. In particular, the group were lucky enough to attend the commissioning ceremony for the project in Rumbugu, to which they contributed the majority of the funds, and helped physically complete. During the ceremony Bishop Benon formally blessed and opened the rainwater tanks, latrines and demonstration facilities (tippy taps, ‘modern’ dish drying racks and compost pits) in front of the entire school, their parents, WATSAN staff, community leadership and local government representatives. If you contributed towards the fundraising, you can be assured that your generosity is received with heartfelt gratitude and appreciation from the local community. Whilst they were in Uganda the group kept an excellent and comprehensive journal of their activities and reflections (plus great photos! ), which can be found here. Please do have a read!